What is it? The second edition of Ludovic Maublanc's heist-em-up. Players are part of a bickering gang, and compete to own the most loot from a successful heist. Listen up gang. Oh, if you didn’t known it yet, you’re in a gang. And you’ve just helped pull off THE heist of the last century. We’re talking valuable art, diamonds and of course money. Truckloads of money. And bullets. And medicine… wait, who did we rob exactly? Welcome everybody to Cash N Guns. Sorry, Ca$h N Guns. Your friend to the end. 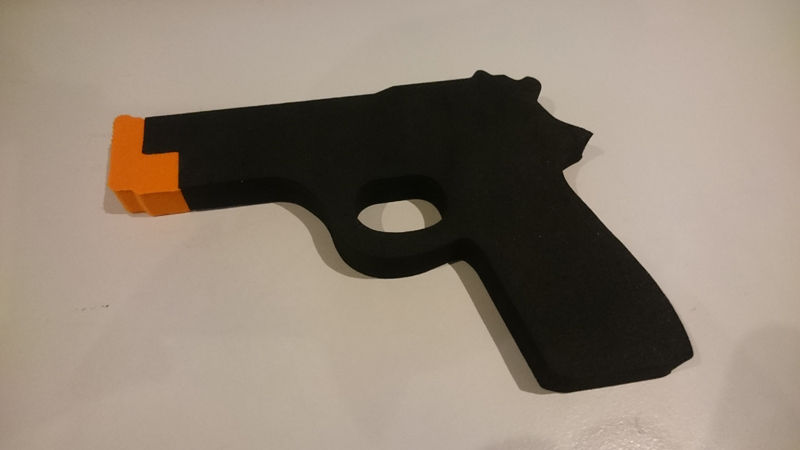 Behold the menace of the foam gun. Some of you may be underwhelmed by the sight of this tool of destruction, but make no mistake friends, it has the power to bring people to their knees. Imagine if you will, staring down the barrel of multiple of these…. foamy monsters, wondering if the end (of your game) is near. The game takes place over 8 rounds. 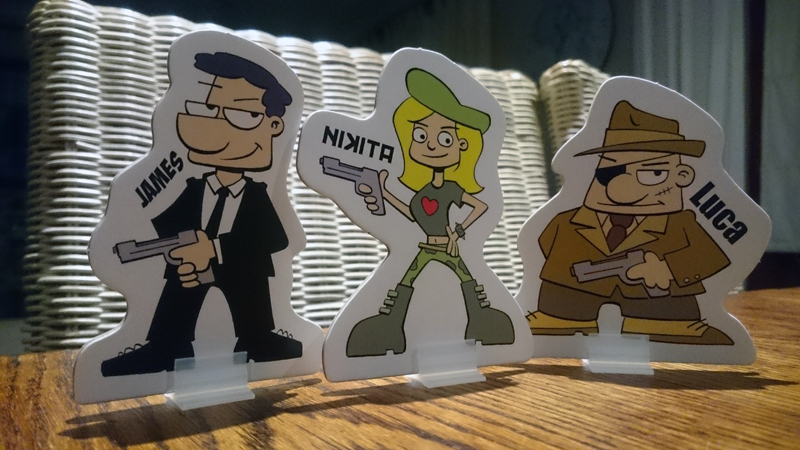 Each player chooses a cardboard cutout character to represent themselves in the game. There’s the British spy (oh James), the female Russian agent, an Italian mobster (obviously), and more to choose from. At the start 8 pieces of loot are revealed, which essentially plots your course of action. You see, after seeing what’s up for grabs, you’ll be asked to put down a card from the eight in your hand (one for each round). 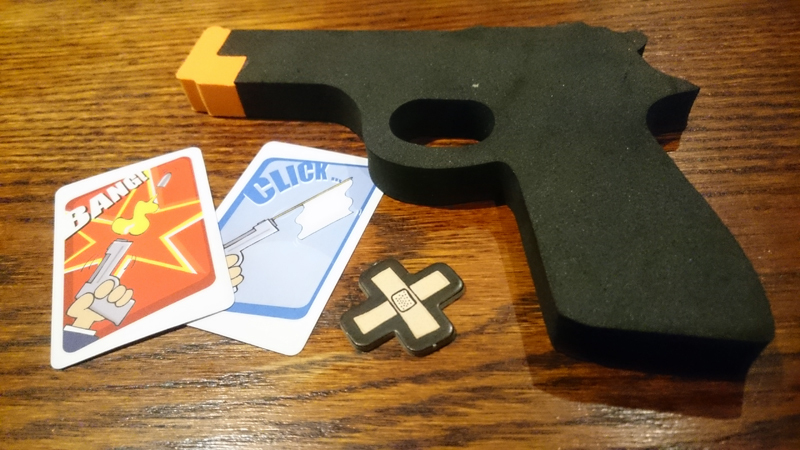 Each player starts the game with 3 “Bang” cards, and 5 “Click” cards. A “Bang” is a real bullet, which eliminates other players from picking any loot this round. A “Click” is a blank, but don’t think that it holds no power, but more on that later. 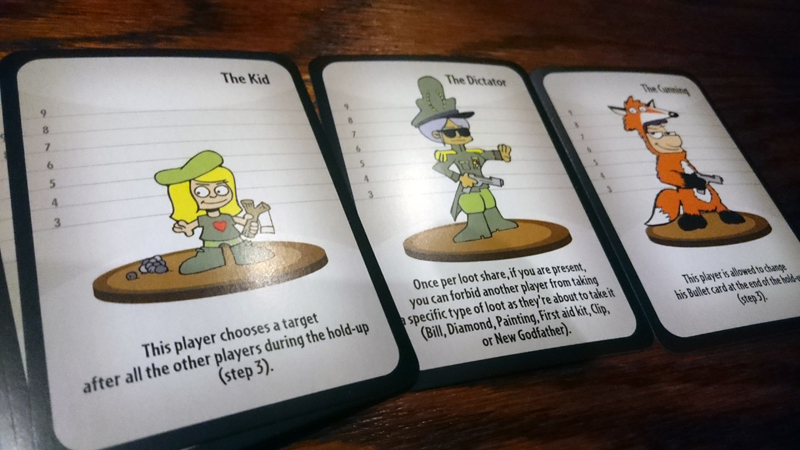 After each player has placed their chosen card for the round face down, the Godfather coun…. wait, there’s a Godfather? Well, he’s essentially the “first player” but he does have a few perks. Where were we? Okay, so the Godfather performs a countdown, after which each player will point their gun at another player. Point it at their faces, make it personal. This is serious business. Also, at this stage if the Godfather has one or more players pointing a gun at him or her, he or she can ask ONE of those gun owners to point their gun at somebody else. After the initial wave of foamy intimidation has calmed down, the Godfather will do another countdown. This time, each player will get to decide whether they want to continue to the end of the round and share in the loot . Each player has 3 health, so if you sustain 3 or more wounds, you’re out for the rest of the game. If 3 players are pointing their guns at you, this might be a good time to sit the rest of the round out. After the second countdown, the active players turn over their bullet cards to reveal what their victims are in for. Note that if you did decide to “chicken” out at this point, you still discard your bullet card but you don’t reveal it since you’re not shooting (and to keep others from getting an idea of what bullets you might have left for future rounds). 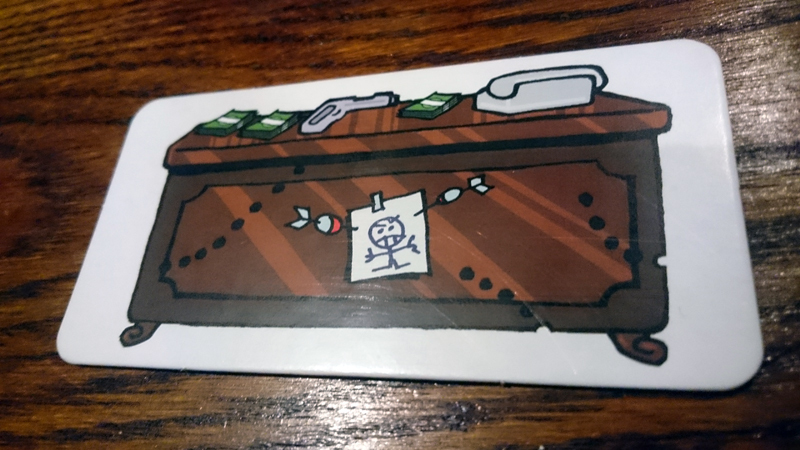 Players that are hit with a “Bang” card, receive a wound marker, and don’t get to partake in the sharing of the loot. Blanks don’t do any damage, and are ignored. Oh, and each bullet (or blank) gets shot simultaneously, so 2 players can hit one another, or a hit from a player that has just received his third wound (and died) will still count. Any players that did not lay down their weapons after the countdown, and did not receive a wound after the second countdown, can now pick some loot. 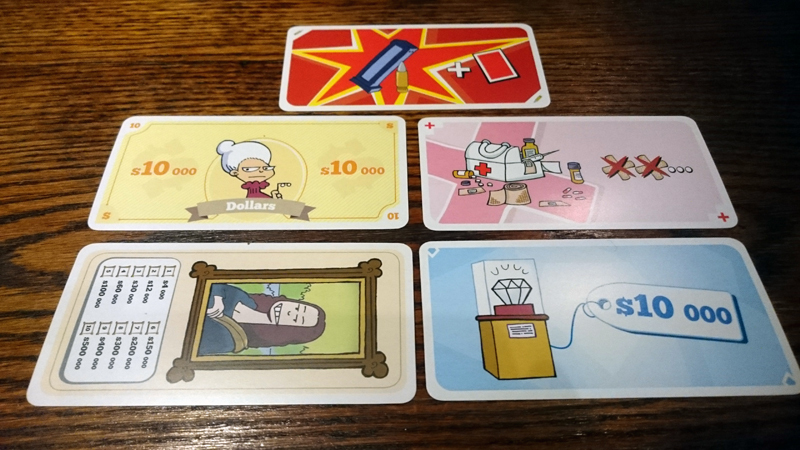 Money – values are shown on each card, either $5K, $10K or $20K. Diamonds – these also have values, either $1K, $5K or $10K. BONUS – the player with the most diamond cards at the end of the game, receives a $60K bonus diamond token. Paintings – these works are not very valuable on their own, but the more you own, the more their value increases. For example, a single painting is worth only $4K, but if you own 4 then you’re looking at going home with a cool $60K. 7 paintings are worth $200K in the end scoring phase. Clips – Additional “Bang” cards for your arsenal. First Aid Kit – These cure two wounds. Yes, this is where a Godfather would run the family business from. But it’s not only loot that’s up for grabs in this phase, as the title of “Godfather” for the next round is also available. You can simply flip over the Godfather desk token to show that it has been used this round, and take the desk standee to show that you are now the new Godfather. CBQ GODFATHER HOUSE RULE – This rule started out because the flipping phase wasn’t explained to us correctly when we played this the first time. So, instead of a player flipping over the desk token, you flip it into the air. If the desk lands face up, then you become the new Godfather. If it lands face down, the the current Godfather stays on. We then added a rule that each player gets a chance to flip the desk token only ONCE a round, or it could take a while. Now the next round begins, and a new set of loot cards is revealed. After 8 rounds of bluffing, eye-brow wiggling and subtle threats, all active players count up their loot, and the richest robber is declared the winner. The game is extremely easy to get into, and if you do want more variety (and mayhem) then there are the “Powers” cards. Each card alters the normal rules in a unique way. These include abilities like prohibiting other players from taking certain types of loot, single bullet wounds not having an effect, or changing your bullet type after everybody has pointed their guns at each other. If you’ve mastered the base rules, throw these cards into the mix. There are 16 different Powers included in the base game. This game be played in different ways. For those just looking for fun, great, you’ll be well rewarded as you point your gun towards the friends you want to annoy most. If you’re looking to play this from a more strategic angle, then surprisingly you’ll also be well catered for. If you’re not the Godfather and you’re low down in the loot-picking queue, do you need to take out other players this round to get a better pick? You’ve got a wound or two but should you take a first aid kit when you really need to grab more loot to keep up? Match the set-collecting element with a high amount of players, and it becomes difficult to establish a runaway leader, which is fantastic. Players are quick to pick up if somebody is trying to loot all the artwork because of the increasing value of a set, or the diamond cards for the end-game bonus. 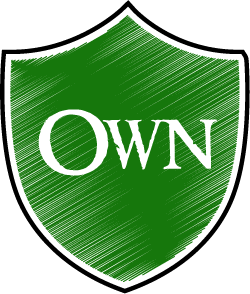 This creates a competitive field where leads come and go. I’ve encountered games where the winner was decided by a mere $1K. When the winner scores are between $100K and $200K, that’s quite an achievement. 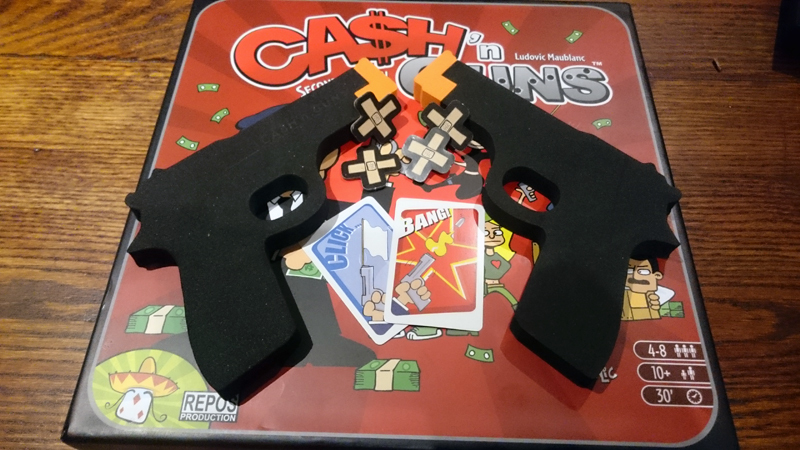 I would go so far as to say you can’t not laugh in a game of Cash N Guns. I’ve never experienced a bad game of it. The only real criticism I can offer is that I’m not a big fan of the artwork (I blame Munchkin), though the components are of a good standard. Ultimately this game is about the special moments it creates. It’s the occasional round where just about everybody shoots each other, leaving one gang member to take ALL the loot. It’s the constant “how could you” glances when couples or friends turn on each other. We’ve played this at expos, and non-players can’t help and be curious about what is going on in this game. It’s a box of guaranteed laughs, and I genuinely can’t recommend it enough. Entertainment from start to finish - one of the best games to introduce new players to, or use at parties. Thoroughly recommended.